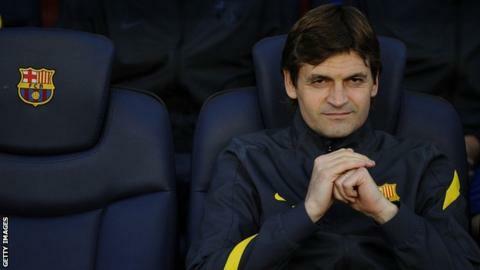 Tito Vilanova has signed a two-year deal to confirm his appointment as Barcelona manager. The Spanish club announced in April that the 42-year-old would take over from Pep Guardiola, who is stepping down after four years in charge. Vilanova, who was Guardiola's assistant, has now agreed a contract to become manager until June 2014. "I'm not scared of there being comparisons between his Barca and mine," Vilanova said. "I'm going to lose all of those comparisons, I know that. But I've not come here to be compared to him, I've come here to do my job." Guardiola won the Champions League twice and the Primera Liga three times during four seasons as manager. Vilanova added: "I've been very fortunate to have won all those titles in four years. We're going to have the opportunity to repeat that, but it's going to be very difficult. "We will not give any game or any title up for lost. We will try to win everything." Vilanova, who had surgery last November to remove a tumour from the parotid gland in his upper neck, admitted he thought hard before accepting the chance to replace Guardiola. He said: "I asked for some to time to think about it because I was also tired and I was coming from a delicate situation. "I had a very important operation a few months ago and I therefore had to talk with the doctors and my family before accepting the offer, but they told me I was perfect. I'm really looking forward to the job." Barcelona have confirmed that Jordi Roura will be Vilanova's assistant, with Aureli Altimira his fitness coach.